The monitor in my truck as I looked at the camera on my trailer on the other side of my 30-by-30-foot barn. I often write about camera's, as I look for the best setup. Camera's help with towing trailers and can be important like good mirrors. 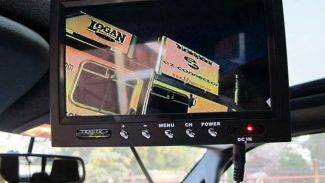 They make hooking up trailers easier, show you blind spots, and keep an eye on what's going on inside your trailer with your prize bull or mare. A popular option on new trucks is back up cameras. Until now the best out there for horse trailers were the corded cameras. Corded cameras have two connections for each camera, a hot wire and camera feed. So for each camera you have to twist together two connections, eight cameras, 16 connections and they don't twist together well in the cold, ice or rain. Everyone wants wireless camera's because of the convenience, but we all want a good picture. That was the tough part until now. Trailer Eyes wireless camera system went with a different wireless signal frequency and uses outside antenna's on both ends. The 5.8 GHz is part of the magic with less interference than the more common 2.4 GHz., with eight channel frequencies for eight camera's to one 7-inch color monitor. The second part of the magic is the antennas coming from the monitor and an antenna with the camera for a 1,200 foot range. Each adjustable antenna has a steel connection, with 16 foot cable so you can put the antenna where it will do some good. These antennas have a magnet base or bolt on it, making them easy to move from the truck to the tailgate for backing up to your trailer, to your trailer for watching horses ride, to the barn to watch a foal, to the backyard for intruders, and to your house while you're gone to see that the teenagers don't have too much fun. Optional wireless video grabber is great for recording off the camera to your computer. So you can record important events from your camera like the next Secretariat foaling while your grandkids watch. The Trailer Eyes founder is an endurance rider for real life field testing of his camera system. The system is quality built, weather proof and camera's are good for wide angle or narrow. It event has automatic infrared for night vision. You can still have some interference or lines in the monitor view from the truck engine, wind or a blizzard, but it's still less than the other wireless camera's I've tried. It has three power choices — 12 volt, 110, or 9 volt battery for backing up to a trailer or for positioning cameras. They come with three different monitor mounts, suction cub, tape and bolt on. I stuck it on the moon roof on the Ford F350 media truck. I like the magnet mounts so I can move camera's around the trailer and the camera on the truck can be moved for backing to the trailer or pointing at a tire that has a slow leak on your trailer. 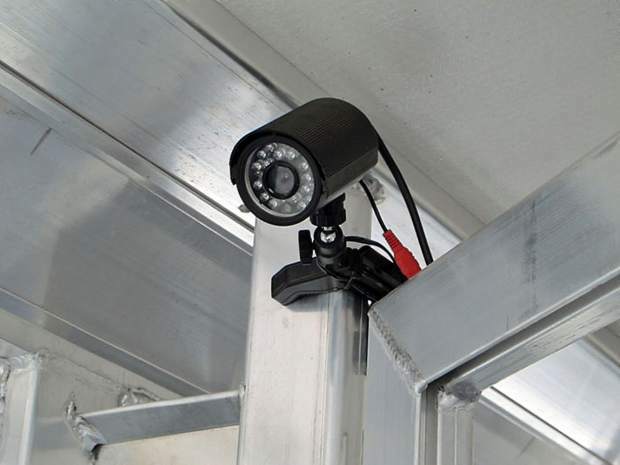 My inside trailer camera's point at horse stalls on the rear side so they don't chew the camera or I can monitor my cargo on horse expo trips. It's an easy five minute installation. They come with a 30 day money back, one year warranty and they even guaranteed reception with 5.8 GHz and boost antenna's. Now you have portable corrals for horse camping or electric fence, and you can keep an eye on the horses while you're cozy in your Living Quarters bed or hotel room.